After delivery, on the 11th or 21st day Punnyavachanam will be conducted. Usually after the postnatal period of the mother the function is performed to purify the House religiously. On this day, mother and the child has to take oil bath in the morning, before the Pandit come to conduct the function. The mother should not see the child and the husband with empty stomach after taking bath. Hence, a small pinch of salt and few strands of rice are provided after taking bath. The same day, the child will be given a name and this occasion is called as “Namakaranam”. In some occasions, due to various reasons the Punnyavachanam is conducted first and the Namakaranam is carried out on a later period. In some families, they do this Namakaranam during the 3rd or 5th month of the child. Both Mom and Child are eligible to go to Temple after the Punnyavachanam function. New dresses are bought for the child, mother and father by the maternal grandmother and grandfather. Sweets are prepared, friends and relatives are invited to attend the function and bless the infant. Paruppu thengai, Vethalai Pakku, Flowers, Fruits are also presented on the occasion. Traditionally, the expenses incurred for Food on that day are born by the Child’s father. My mom accepted a small amount to satisfy my husband. After performing the Pooja, the Pandit asks the Infant’s father and mother to utter the name on the right ear of the child. This is how the infant is officially named. Our ancestors have a belief of naming the child with the name of their grandfathers/grandmothers. However, since some of the family members do not want to utter the name of elders in front of them as a matter of respect, they started giving an alias name to the child. This alias name is usually used in the home. The name officially announced by the Pandit in the function is called as Sharma name and used while performing religious functions or while doing Archanai in the temple. However, this Sharma name comes into effect after Upanayanam for male child. Few families have the habit of giving three names for the child. In my family, we have 4 girls with the same name since it is the name of my maternal grandmother. This goes well with my paternal grandmother’s name too. The same day, the infant will be placed in a well decorated cradle and relatives used to sing songs. This function is usually conducted in the evening. Avoid using lot of flowers to decorate. The infant may not be able to bear strong odor of flowers. Nowadays, we started conducting this function in the morning itself at the end of Punnyavachanam and Namakaranam. 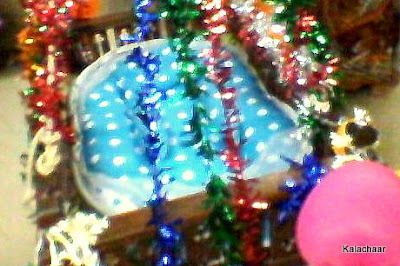 The cradle is made of wood and usually not available in all houses. Some people used to preserve the cradles used by the elders in their family and allow their friends and relatives to use the same. This wooden cradle is used formally on this day and we are free to use the new ones available on stores. In a plate, paddy is spreaded and the child's uncle used to write the name on the paddy. This is kept beneath the cradle. From this day onwards, we used to place Dhristhi pottu on the forehead and cheeks for the child. Paternal Aunty of the child buys Velli Kaappu (Kolusu/Thandai), Thanga Kaappu (golden Bangles) for the child. Aympon kaappu (5 metals) is also bought for the child. In turn, the child’s Aunty is gifted with a saree or some gift. A small piece of the umbilical cord (thoppul kodi) is also preserved and kept inside the Thayathu and Tied in the black rope around the child’s waist along with Nai kasu preferably made of Seppu (Copper). This is applicable for both male and female babies. Additionally, for female babies Arasa Ilai is also tied. For male babies Thambi Thozhan is added. These are also available in Jewellery shops. We prepare Sundal (preferably Black Channa) on this day and distribute to the relatives. A small bunch of sundal is tied in a plastic cover and kept on the corner of the cradle. Kaapparisi is also prepared and distributed to the invitees. Wonderful write up mythili. Few information are new to me. We need to pick the thoppul Kodi once it fall down on its own. Then a small portion of it is placed inside the thayathu.